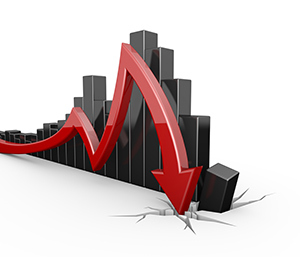 Will the Stock Market Crash After the Next Fed Rate Hike in 2016? Subject: Will the Stock Market Crash After the Next Fed Rate Hike in 2016? There's a strong chance the U.S. Federal Reserve could raise interest rates later this year, and that's prompting new fears of a stock market crash. 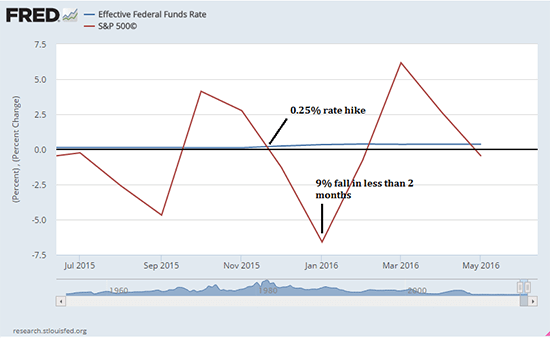 Before we get to the probability of a Fed-triggered stock market crash in 2016, let's look at how investors initially reacted to the Fed's last rate hike in December. While there was no stock market crash, the markets had a huge correction a few weeks following the Federal Reserve rate hike on Dec. 15, 2015. The Fed announced it would raise rates by a quarter percentage point, and the S&P 500 fell 9% between Jan. 4 and Feb. 11. The S&P 500 line reflects monthly % change. More than 93% of investors were in the red in January, according to CNN Money. And investors yanked over $24 billion from stocks over the first three weeks of January, according to Bank of America. A big portion of this panic was caused by the quarter percentage point rate hike, but not all. At the time, many investors were also fretting about China's market stability and low oil prices, according to Money Morning Chief Investment Strategist Keith Fitz-Gerald. Still, for even a small rate hike to rattle the markets, that's a testament to the Fed's market-moving power. Will a Fed Rate Hike Trigger the Next Stock Market Crash? No, don't expect a full-out stock market crash after the Fed's next rate hike. But do be ready for another market downswing like we saw between January and mid-February. That's because the Fed's next rate hike is likely to be another 0.25% – just like last December. So be prepared for a similar reaction from investors. But don't expect a rate hike this week, when the Federal Open Market Committee (FOMC) ends its meeting tomorrow. There's only a 2% chance of one in June, according to the CME Group. The CME Group predicts a 38% and 58% chance of a rate hike in November and December, respectively. On May 24, Philadelphia Federal Reserve Bank President Patrick Harker hinted the Fed could hike short-term interest rates up to three times in 2016 if the economy continues to show signs of recovery. And more recently, Fed Chair Janet Yellen announced on June 6 that the latest jobs report won't sway the Fed from raising rates gradually over time. The United States added only 38,000 jobs in May, which was far below expectations of 164,000, according to CNBC. With a rate hike very likely to happen this year, U.S. companies have already started thinking about tightening their purse strings. According to Money Morning Global Credit Strategist Michael Lewitt, companies' expenditures are being propped up by enormous amounts of debt. Lewitt says that companies are more leveraged right now than before the financial crisis in 2008. The leverage is being shrouded by low interest rates, Lewitt says, and will need to be repaid at some point. There's a huge problem though: Companies don't have enough cash flow right now to pay off debts. Back in November 2015, Goldman Sachs released a bombshell report that showed corporate leverage is at its highest in a decade. And corporate cash flow has failed to keep up with companies' splurge in bond sales. The investment bank also reported that net debt to earnings is at its highest point since the Great Recession. "The average junk-rated company has little cash, too much debt, and no free cash flow to repay its debt, and is only being kept afloat by low interest rates," said Lewitt. "This is the real story that Wall Street and its prostituted analysts won't tell." And it'll only get harder to pay back debt in the future once the Fed raises interest rates. This can hurt companies' earnings and spook investors out of stocks. Then you'll see share-price declines start to hit the S&P 500 and Dow. That being said, a quarter percentage rate hike with lots of warning won't cause companies to immediately panic about deleveraging. The next rate hike will bring the Fed's target rate up to 0.75%. That's pretty meager compared to past rate hikes pre-Great Recession. Also keep in mind: You don't have to exit the markets when the Fed raises interest rates. There are still plenty of safe investments out there. For starters, check out one of Money Morning's best stocks to buy before the next Fed rate hike. This stock has a history of weathering Fed-incited market downturns and is trading at over $100 per share higher than the price it was averaging before the Great Recession.